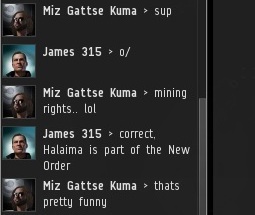 As I was enforcing the Code in Halaima, the heart of our great empire, I accidentally sent one of the miners an invitation to a private convo. 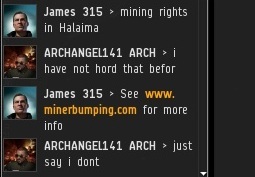 Since the miner was willing to talk, I gave him the info that I would normally give a miner in local. At first, things seemed to be going smoothly. ...But then I began to suspect ARCHANGEL141 ARCH might not be entirely fluent in English. These situations are always awkward, which is why I encourage everyone who is able to quickly learn English, if they're going to mine in my territory. English is the language of the New Order, the language of bumping, the language of the Supreme Protector. But I do my best to remain patient. I'm not just about enforcing the Code; I'm also in the business of building bridges. Suddenly, another person joined the private convo. ARCHANGEL141 had apparently invited an interpreter from his corp to facilitate the discussion. But that proved to be unhelpful. I resumed bumping ARCHANGEL141 out of range. The miner retreated from the ice field and docked up, where he spent his time carefully drafting a complaint. 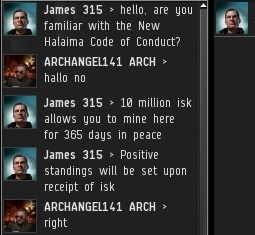 As I continued helping other miners comply with the Code, I noticed one of ARCHANGEL141's corpmates enter the ice field. 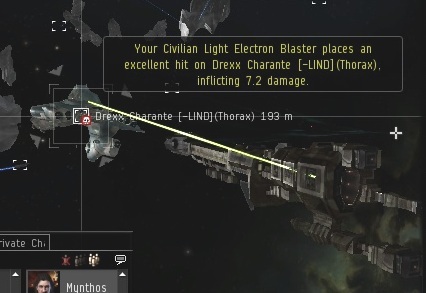 He was flying a thorax-class cruiser, and he began giving me the carebear stare. Out of nowhere, he attacked! He scrammed and webbed my Invincible Stabber, and began firing madly with tech II blasters from optimal range. A traditional ganking setup, and he managed to tackle me! Clearly, this assassin knew more about suicide ganking than the guy who tried to smartbomb me with a merlin. But I had a few surprises of my own. Prior to the day's bumping, I had secretly equipped my normally gun-less ship with a formidable weapon: A civilian light electron blaster. It came free from some guy's velator, and it doesn't require ammunition. Now the game was afoot! 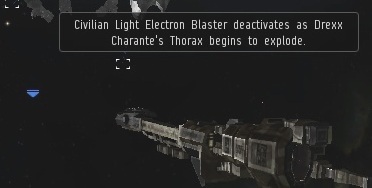 The civilian light electron blaster crackled with energy as it sent a deadly bolt toward the hostile thorax. The rebel had visions of my death dancing in his head, but now the tables had turned, and he was repaid for his murderous intent with the chance to witness the power of my fully-armed and operational bumping ship! The thorax's hull groaned and shuddered under the repeated blows. The hammers of justice were too great, and the structure of the mighty thorax came roaring apart. In total, fifty points of damage were inflicted. The battle all but won, my loyal Concord soldiers dutifully mopped up, dealing the remaining 99.18% of the damage needed to destroy the thorax. I would describe the explosion, but evidently I don't have that effect enabled, so I didn't see one. 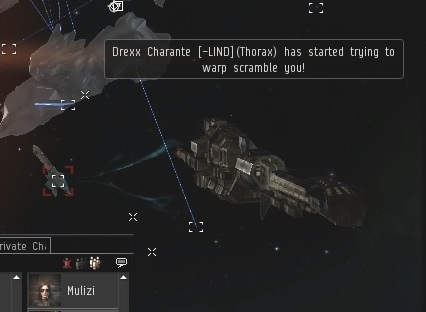 A blue wreck popped up and Concord stepped aside so I could claim my hard-won loot. 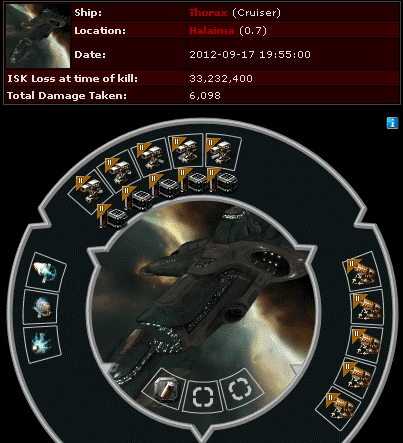 The loot confirmed that it was a proper gank setup, though perhaps the assassin should have used a destroyer instead. My shields had gone down to 88%, but that was remedied by docking up to unload my loot at the Halaima station. I tossed the gear in my hangar with the rest of the weapons taken from wrecks of my fallen enemies. 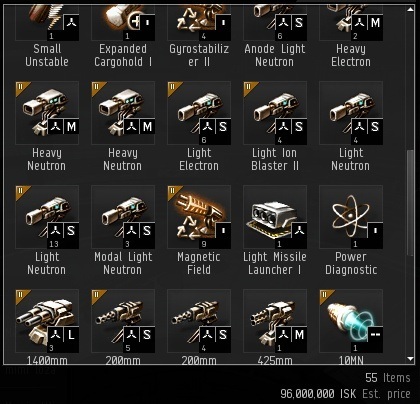 Nearly one hundred million isk of loot from those who thought they could defeat my Invincible Stabber--in Halaima alone! This was the first battle fought under the banner of the stars and clover, the emblem of Experimental Fun Times Corp. Having achieved a positive kill-to-death ratio, our killboard is green. In the end, ARCHANGEL141 and his corpmates learned a valuable lesson. The bumper, not the miner, reigns supreme in highsec, now and always! I think thats the point though; he calls his stabber invincible because he's aware that the miners don't have the conviction to blow it up. Physically; sure, it can explode. But it won't. 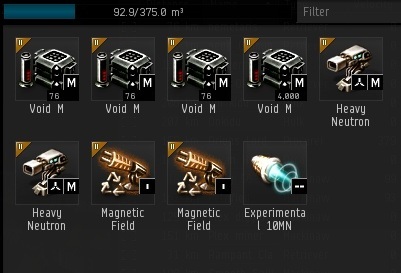 I can always find my way back to high sec and we can find out :D and then we can go bump some afk miners once we have divided by 0 and figured out that the Invincible Stabber truly is invincible. I truly hope your eyes explode. DOWN WITH YOUR FALSE CODE! As ever, you lie. The sooner you are hounded from New Eden, the better.